"I want to make it quite clear that our officers will take these sightings extremely seriously and will record them. It is important we are alert about this type of thing so we can try and plot the areas where we have a high density of sightings." 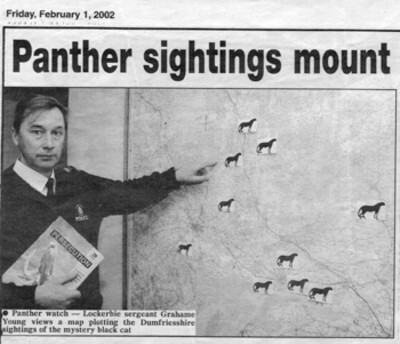 Lockerbie sergeant Grahame Young, the area's wildlife liaison officer. The contact for Central Scotland Police is Inspector Ian Cameron in Alloa (Tel: 01259 723 255). Lockerbie sergeant Grahame Young, the area's wildlife liaison officer can be contacted at 01576 202 404. The contact for Fife Constabulary is Inspector Bill Harley in Glenrothes (Tel: 01592 418 888). The contact for Lothian and Borders Police is Sergeant Malcolm Henderson in Hawick (Tel: 01450 375 051). The contact for Northern Constabulary is Inspector John Grierson in Inverness (Tel: 01463 715 555). The contact for Strathclyde Police is Inspector Kevin Duffy at Headquarters (Tel: 0141 532 2641). The Force Co-ordinator is based in the Community Development Department at Aberdeen (Tel: 01224 709970). The contact for the Ministry of Defence Police is Constable John Simpson in Coulport (Tel: 01436 674 321).